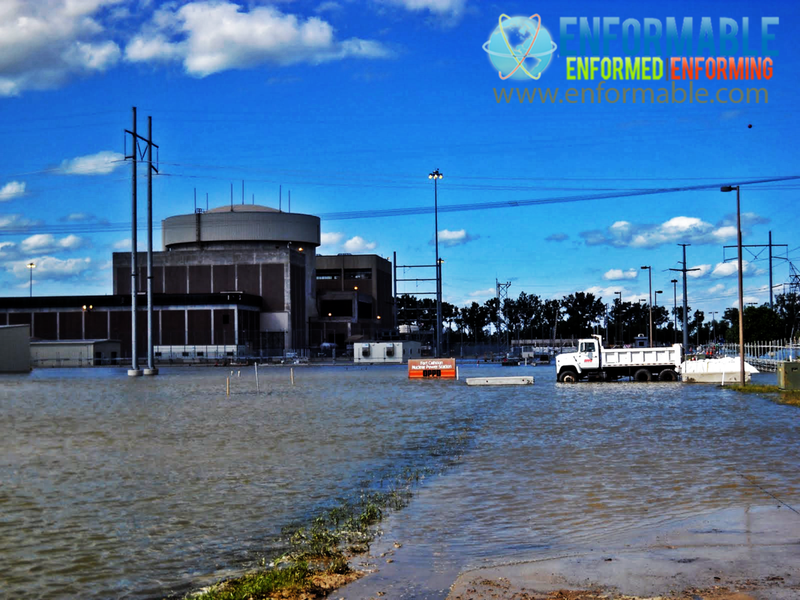 The Fort Calhoun Nuclear Generating Station is a nuclear power plant located on 660 acres (270 ha) between Fort Calhoun, and Blair, Nebraska adjacent to the Missouri River between mile markers 645.6 and 646.0. The utility has an easement for another 580 acres (230 ha) which is maintained in a natural state. The power plant is owned and operated by the Omaha Public Power District of Omaha, Nebraska and accounts for 25 percent of OPPD’s net generation capabilities. Fort Calhoun houses spent fuel rods in a 40 foot deep spent fuel pool next to the reactor, and when the pool had nearly reached capacity in 2006, OPPD began to store spent fuel rods above ground in dry cask storage as well. 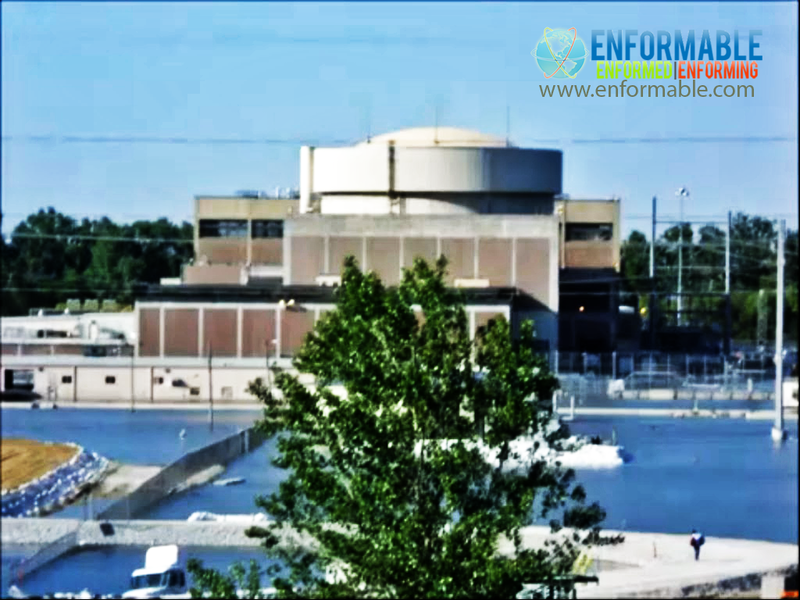 In total, the Ft. Calhoun reactor has 600,000 to 800,000 pounds of high level nuclear waste. 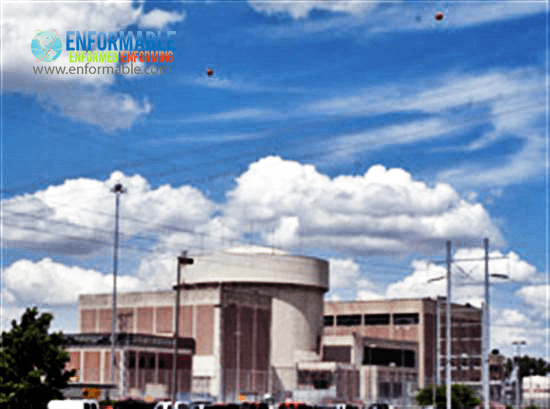 The storage was not designed to house spent fuel permanently, but when plans for Yucca Mountain nuclear waste repository were terminated, OPPD stated that they are “prepared to safely store material on-site as long as necessary”. 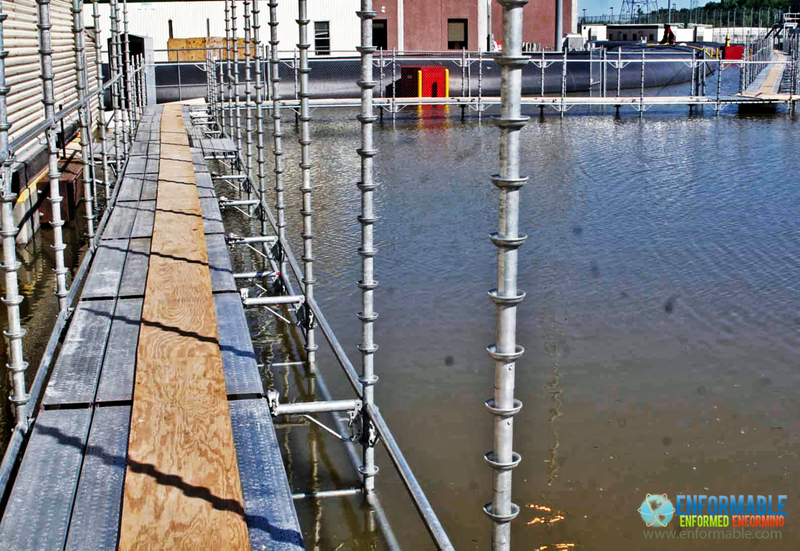 The assessment also indicated that the facility was not adequately prepared for a “worst-case” flooding scenario. 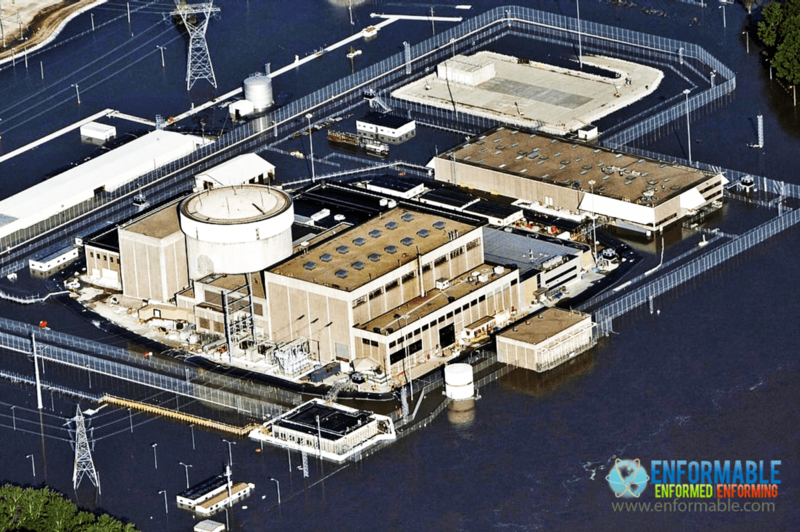 A number of potential flood water penetration points were discovered that could have impacted the raw feed water supply to the cooling system, the auxiliary water supply and main switchgear (electrical) room. By early 2011, corrective measures had been implemented. 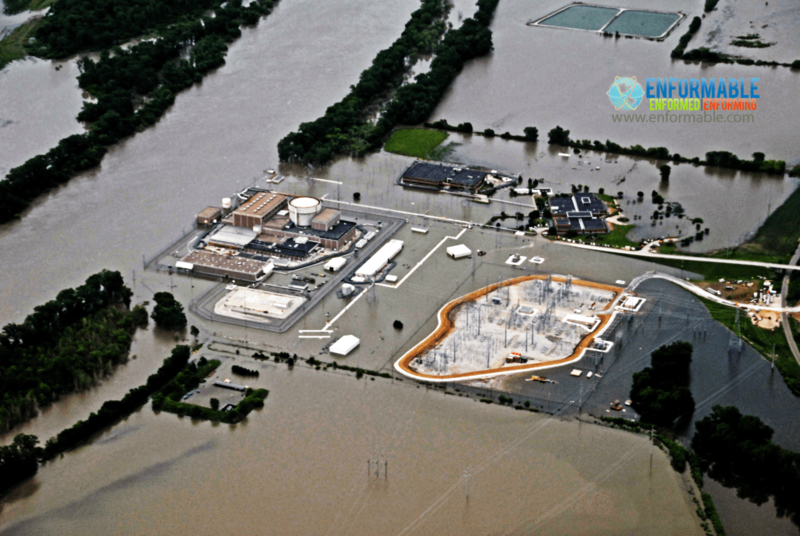 On June 6, 2011 the Omaha Public Power District, as required by Nuclear Regulatory Commission guidelines, declared a Notification of Unusual Event (minimal level on a 4 level taxonomy) due to flooding of the Missouri River. The Missouri River is above flood stage and is expected to rise further and remain above flood stage for several weeks to a month. 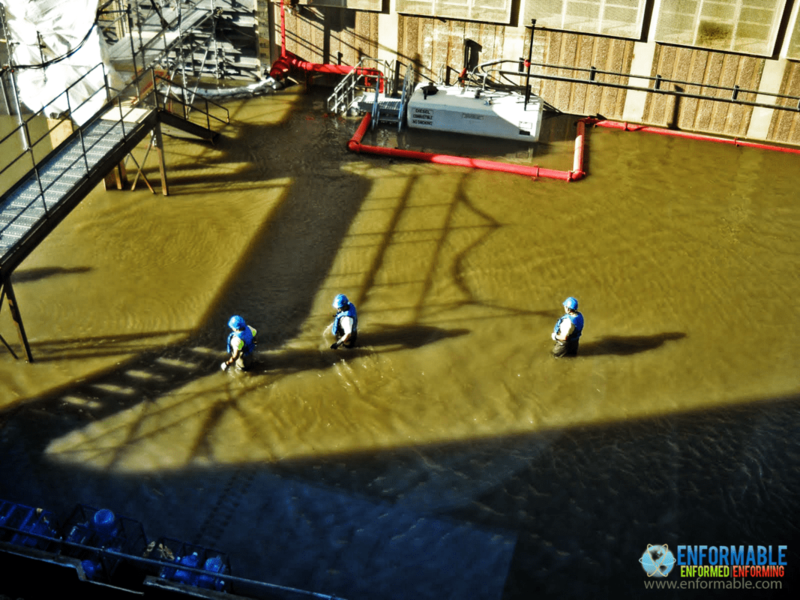 Contractors have been busy installing sandbags and earthen berms to protect the facility from flooding. 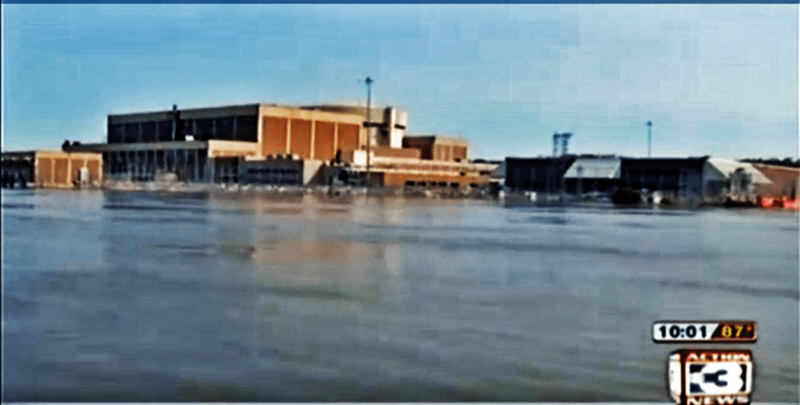 According to officials, the plant was built to withstand a 500 year flooding event and though by June 14, 2011, much of the facility was surrounded by the swollen Missouri River, Omaha Public Power District officials were confident that enough redundancies were in place to ensure adequate safety. 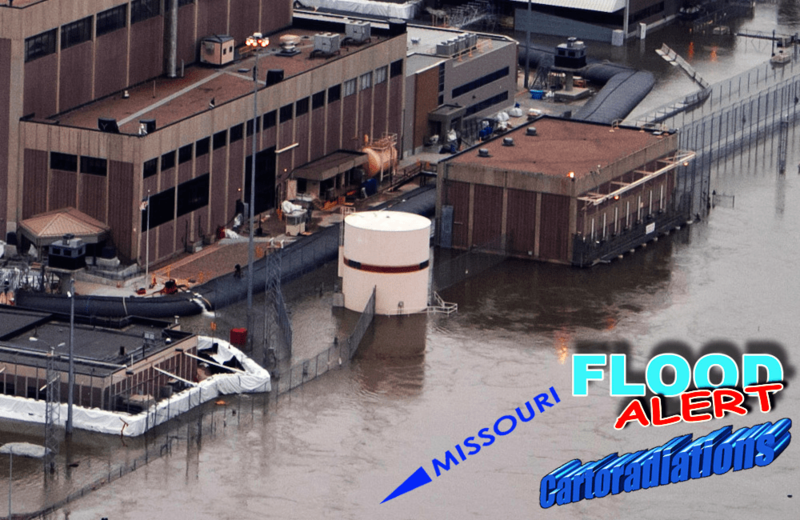 It was reported on June 17, 2011 that the plant was in “safe cold shutdown” mode for refueling and the anticipation of flooding, and that four weeks worth of additional fuel had been brought in to power backup generators, should they be needed. The Army Corps of Engineers indicated that with average precipitation, the Missouri River would not go above 1,008 feet (307 m) above sea level and OPPD officials stated that the current flood protection efforts would protect the plant to 1,010–1,012 feet (310–308 m) feet above sea level. Officials indicated the spent fuel pool is at 1,038.5 feet (316.5 m) above sea level. On June 7, 2011, an electrical component in a switch gear room caused a small fire with Halon extinguisher activation which forced a partial evacuation. The fire was no longer burning when the on site fire brigade arrived and according to officials, the public was never in any danger. The fire impacted pumping of coolant water through the spent fuel pool. Cooling was interrupted for 90 minutes while the estimated time for the pool to reach boiling temperature was over 88 hours. In response, the Omaha Public Power District declared an alert (second level on a 4 level taxonomy). The evacuation was the first at the facility since 1992, when 20,000 US gallons (76,000 l; 17,000 imp gal) (ca. 76 t) of coolant leaked into a containment building from the reactor. On June 23 a helicopter contracted by OPPD to survey transmission lines made an unplanned landing 1.5 miles south of the plant. Reports described it as an unplanned landing although photographs showed it on its side in a field. Nobody was injured. 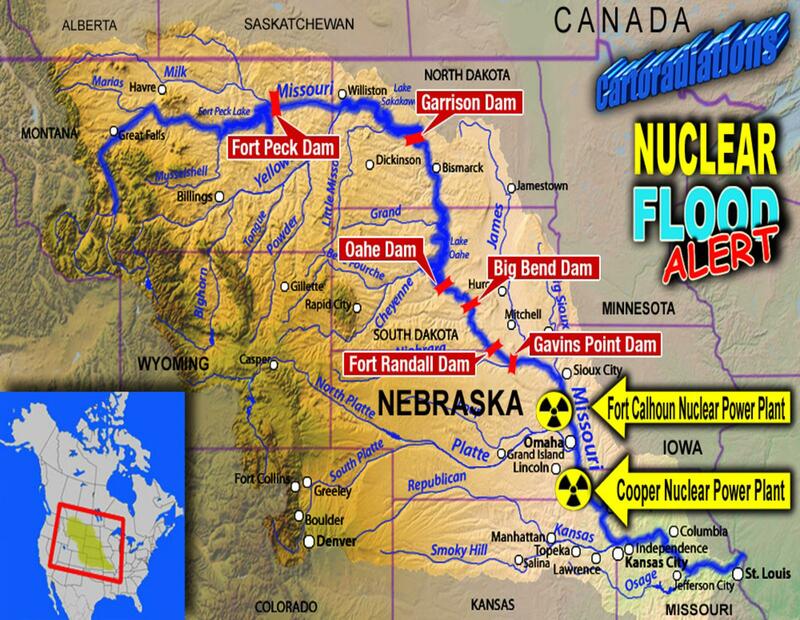 The Federal Aviation Administration had declared a “temporary flight restriction,” in a two nautical mile radius, centered on the Fort Calhoun nuclear facility. This restriction went into effect on June 6, 2011, at 4:31 PM, and remains in effect “until further notice.” Officials noted that the June 6 FAA directive was actually a reminder to a standing order creating no flight zones over all U.S. nuclear power plants which had been in effect after the 2001 9/11 attacks. 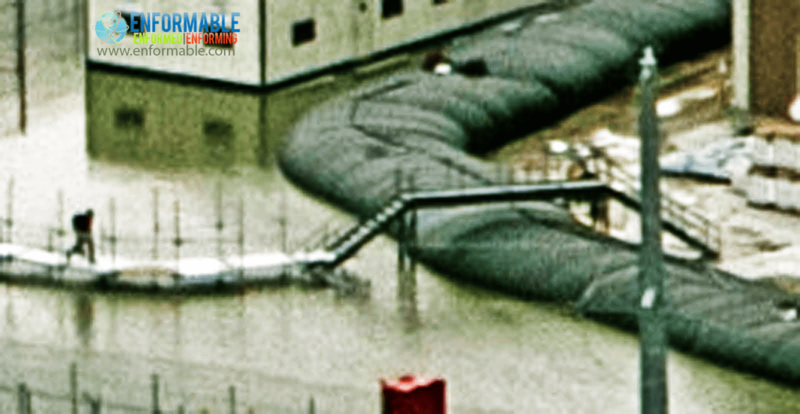 On June 26, at 1:30 a.m., a 8 feet (2.4 m) high, 2,000 feet (610 m) long water filled rubber flood berm surrounding portions of the plant, was punctured by a small earth mover (“Bobcat”) and collapsed. 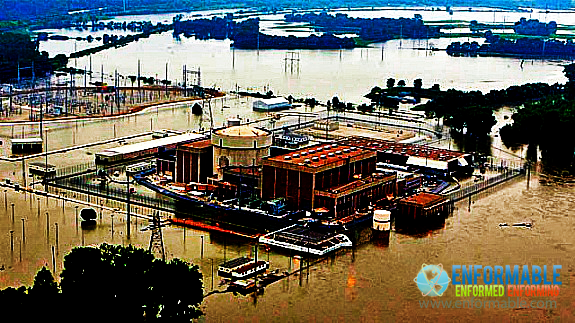 The collapse of the flood berm allowed flood waters to surround the auxiliary and containment buildings at the plant, and also forced the temporary transfer of power from the external electricity grid to backup electrical generators. 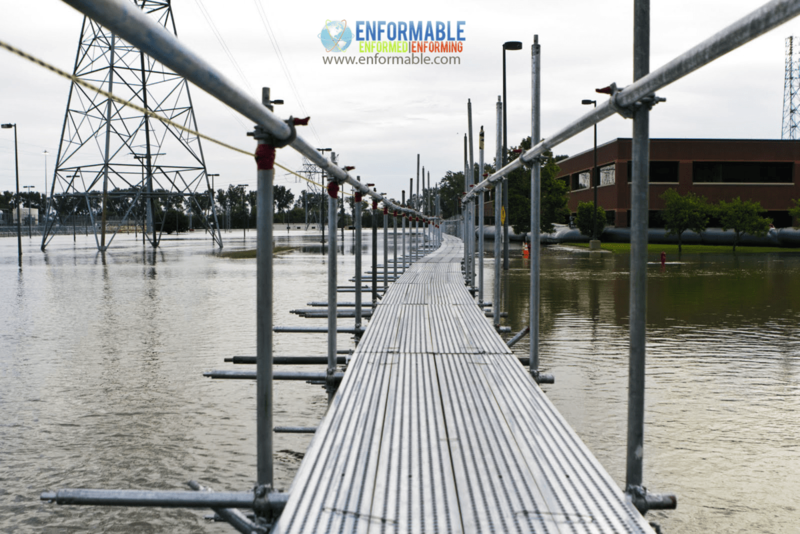 It was reported more than 2 feet (0.61 m) of water rushed in around buildings and electrical transformers. 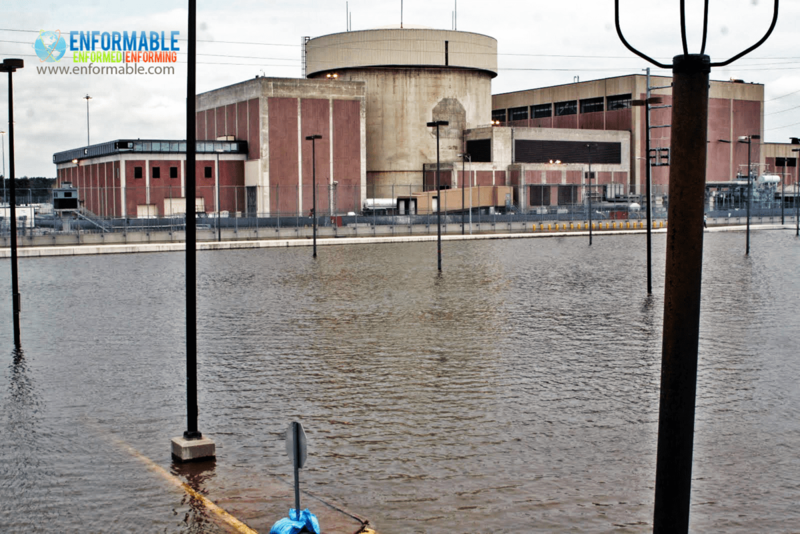 Backup generators were then used to ensure the facility maintained electrical power for cooling. 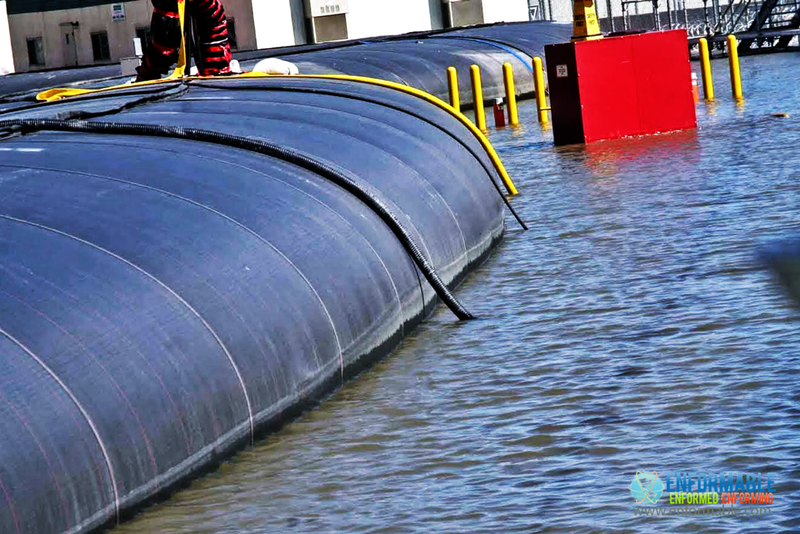 The rupturing of the flood berm also resulted in approximately 100 US gallons (380 l; 83 imp gal) of petroleum being released into the river as many fuel containers were washed out. The fuel/oil containers were staged around the facility to supply fuel for pumps which remove water within the flood containment barriers. 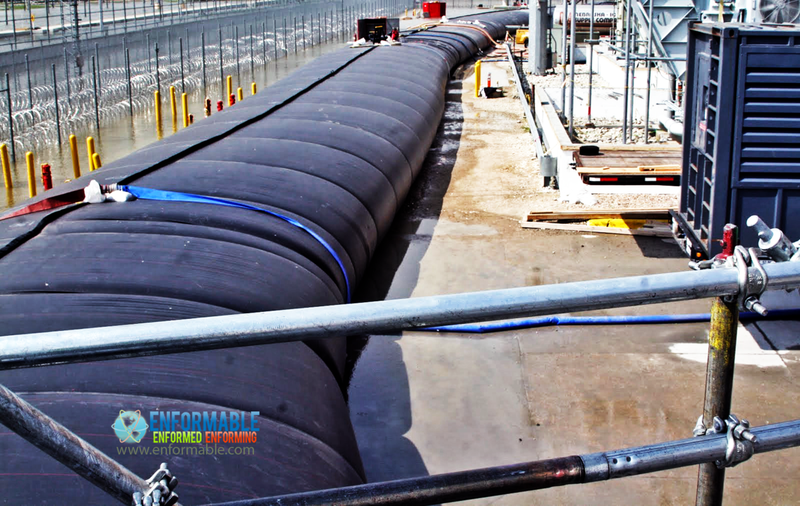 The rubber berm was a secondary measure not mandated by the NRC and was put in place by OPPD to provide additional room for work immediately outside the reactor buildings. 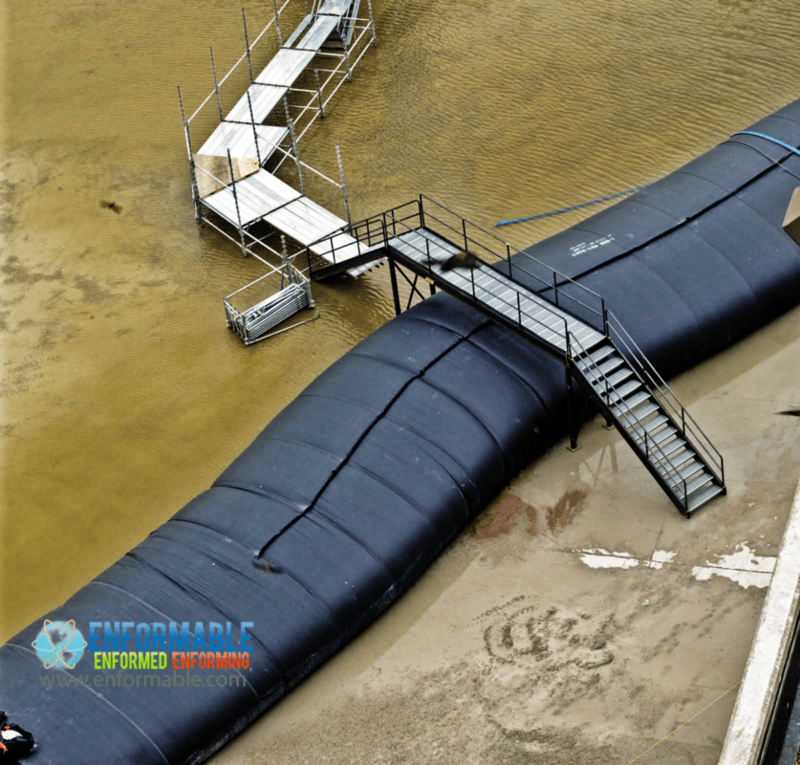 According the NRC, the water-filled berm “protects several pieces of equipment that have been brought onsite, including an additional emergency diesel generator for supplying AC electrical power, water pumps, firefighting equipment and sandbagging supplies”. According to OPPD, the plant is designed to withstand waters up to 1,014 feet above mean sea level. The river is not expected to exceed 1,008 feet. 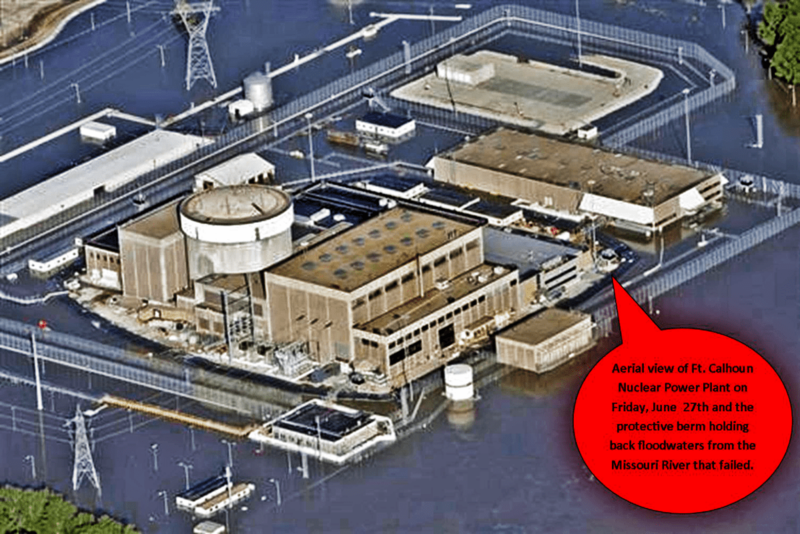 NRC officials were at the plant at the time and NRC statements said the plant remains safe. 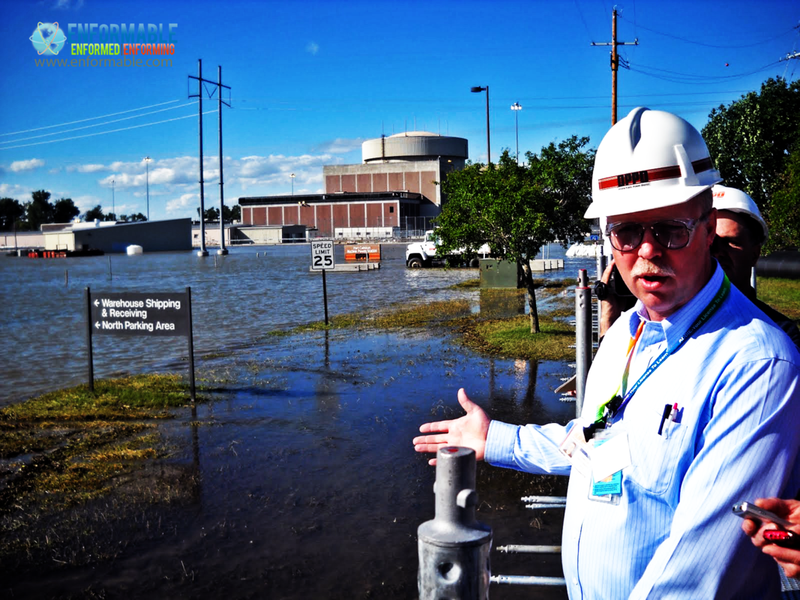 NRC Chairman Gregory Jaczko confirmed the plant’s safety when he visited the plant on June 27. On June 30 one of the pumps used to remove seepage caught fire when a worker was refilling it with gasoline. The worker put the fire out with a fire extinguisher but was burned on his arms and face and he was airlifted via helicopter to Lincoln, Nebraska. OPPD said the fire was in an auxiliary security building area and not in the reactor area and that the plant was never in danger. 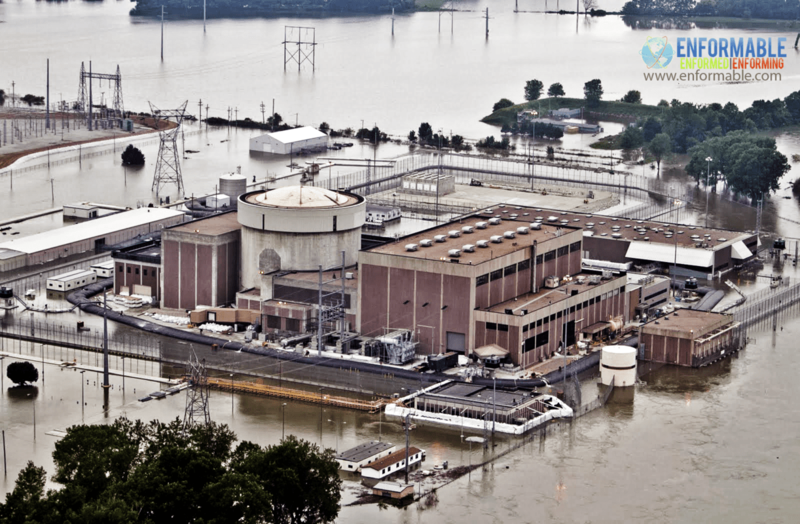 On July 1, the privately owned Vanmann #30 levee at Mile Marker 637 to 637.5 on the Iowa side, about 10 river miles south of the reactor, was blown up by a group of private citizens representing the levee. 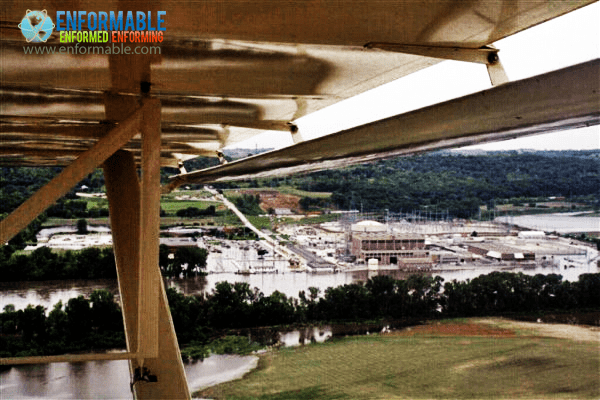 The levee destruction was done to alleviate flooding in a bend of the river where water was pooling on cropland and creating an enormous water pool directly opposite the reactor. Authorities initially reported a 3 to 4 inch rise in the river after the levee was blown. Both the US Army Corps of Engineers and the Iowa Department of Natural Resources said they did not regulate the levee. 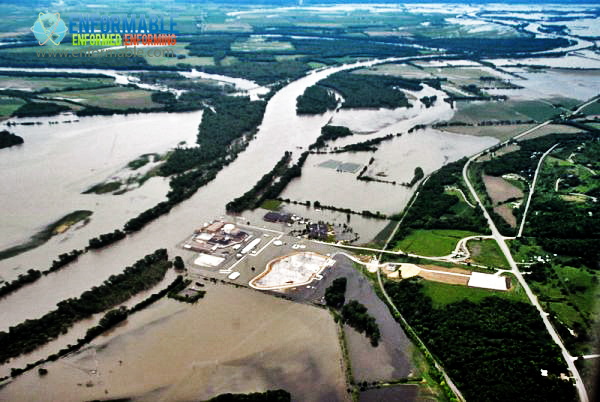 Flooding on the Iowa side had been a source of considerable concern after a June 25 levee breach upstream of the reactor nearMissouri Valley, Iowa, prompted evacuations of 18 homes, temporary closing of the Blair Bridge (while flood walls were built to protect the Iowa approach) and closing of DeSoto National Wildlife Refuge on the DeSoto Bend. They had raised the levee height in anticipation of the flood but after the upstream breach they had sought permission to lower it so that water could flow back into the river. When both Iowa and the Corps said they did not have authority over it the levee board blew it up at approximately 10 a.m. on July 1. 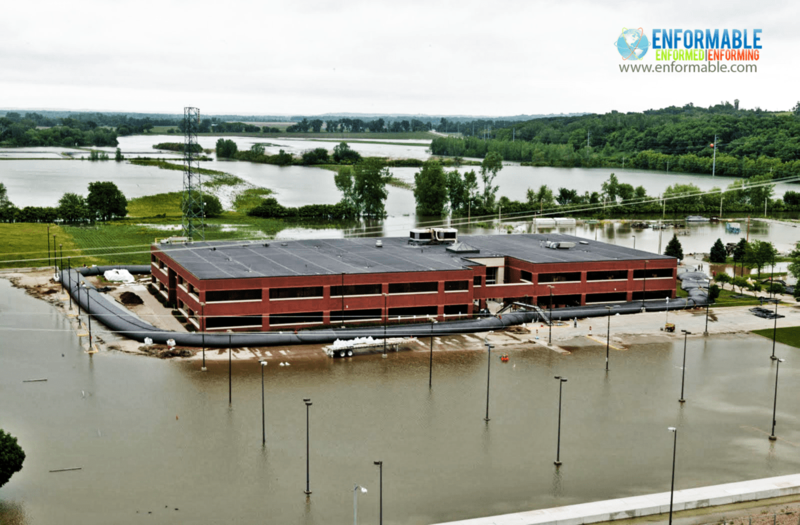 Pottawattamie County, Iowa officials initially said they were notified only minutes prior to the levee being blown up, but those overseeing the levee had notified Harrison County, Iowa officials earlier. On July 11 OPPD installed a new 8 foot inflatable berm to replace the one that was punctured and failed on June 26. “During the emergency notification the automated paging function did not cause the pagers to actuate. The issue is being investigated.” A notification for 10 CFR 50.72(b)(3)(xiii) be added to the header. The licensee has notified the State of Nebraska, Harrison County, Washington County, and Pottawattamie County of the termination. Notified R4DO (Proulx), IRD (Marshall), NRR (Thorp), DHS (Rickerson), and FEMA (Dennis).